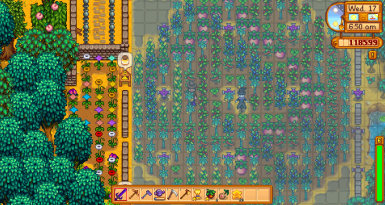 Displays the range of sprinklers, scarecrows, bee houses, and junimo huts so you can ensure your crops are watered, won't be eaten by crows, and your bee houses will produce special honey! Complete re-write of the entire mod. Tiles are no longer outlines and always filled in. Added item hovering and holding! I accidentally uploaded the file with a config.json. This was removed so updating the mod no longer removes your saved config. Color scheme updated! I changed the colors to look nicer, but you can have the old colors back if you want - set 'UseOldColorScheme' to true in the config. Now shows the range of bee houses in yellow! This is activated by a different key than normal (f3 by default) but can be changed in the config. 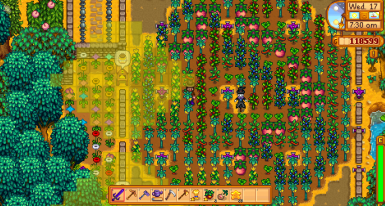 This mod displays the range of the sprinklers, scarecrows, bee houses, and junimo huts that you have. 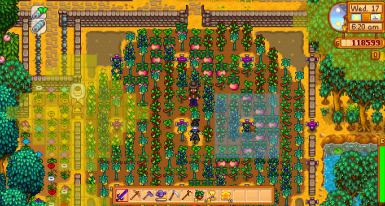 It works anywhere you can place sprinklers, scarecrows, or bee houses (including the greenhouse). 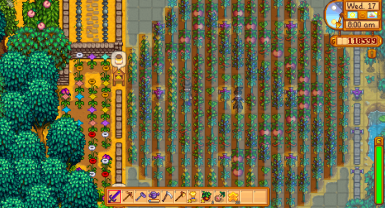 Press the activation key (default f2) to switch through showing scarecrows, then sprinklers, then junimo huts, then bee houses, then all at once, then none. 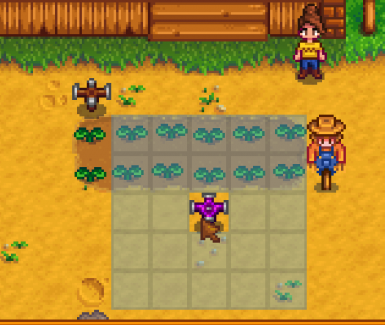 Press the modifier key (default left control) and hover over an item in the world (sprinkler, scarecrow, etc) to see the range of just that item. The range of items that you hold (sprinklers, scarecrow, bee house, etc) will be displayed at your mouse cursor while you're placing them. You can specify multiple keys to activate for each option n a comma separated list. For example, 'leftcontrol,rightcontrol' for modifier key lets you use either of your control keys. Note: Both the item hovering range display and item holding range display can be disabled, see the config file. Complete re-write of the entire mod. Tiles are no longer outlines and always filled in. Now works with Better Sprinklers and Simple Sprinkler (v2.3.0)! Now works with Prismatic Sprinklers (v2.6.0)! 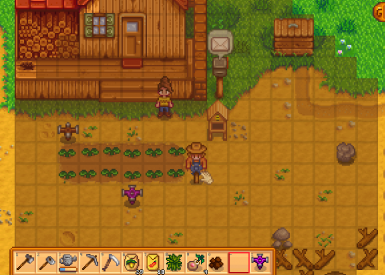 Place the 'Range Display' folder in the Mods folder inside of the Stardew Valley folder. Check out my other mods by clicking here!